Choosing a human resources consultant for your nonprofit organization can feel like a major step forward. Most young nonprofits work hard to secure a foothold in their communities, so reaching the point where they could benefit from guidance on managing their growing internal operations is a milestone that should be celebrated. Human resources is a fairly broad topic on its own, generally encompassing both the structured and more informal interactions between an employer and its employees. This includes functions including and not limited to hiring, compensation, training, and maintaining company culture. All organizations, for-profit and nonprofit, need concrete human resources policies and goals in order to achieve long-term, sustainable success. State and federal employment laws — Nonprofits aren’t exempt! We’ve written before on the unique challenges that nonprofits face when it comes to employee compensation, most of which involve tight budgets. However, it’s completely possible to build a sustainable, properly-scaled compensation strategy for any organization. The same is true for your more general human resources strategy, too. Use the list above to jump to a specific section, or follow along with us from the top. You’ll be ready to start researching potential human resources partners in no time! The organization is going through a transitional period. Times of quick growth or changes in leadership are typical examples. These periods are great opportunities for organizations to make any important changes or updates to their human resources structures. The nonprofit is experiencing retention or recruitment issues. Nonprofits experience these issues like any other type of organization, and HR often represents the first line of defense for combatting turnover and developing stronger, more holistic compensation strategies. The organization simply needs to build out its first set of human resources processes. As mission-driven organizations with fairly tight budgets, growing nonprofits often postpone developing concrete human resources policies, processes, and departments until they’ve been up and running for a while. Of course, the exact reason an organization decides to hire a nonprofit human resources consultant will vary. However, all of the situations listed above have one thing in common: the organizations want or need more stable foundations on which to grow. Well-developed and properly-scaled human resources programs will strengthen your organization’s ability to grow sustainably. An outside expert is in a great position to help determine which strategies will be most effective in the long-run. 1. Examine your own goals and needs. Think about why you need a human resources consultant and what you need or want to accomplish by working with one. Chances are your reasons will fit into one of the general situations listed above, but your exact goals will probably be a bit more varied. Clearly defining your goals and needs (or at least having a clear sense of what you need to accomplish) will go a long way to both help you find the perfect partner and streamline their job later on. 2. Build a hiring team. Getting multiple perspectives on potential HR consultants will help ensure you find the best fit. Teams are also useful for delegating tasks, like researching candidates and reviewing proposals. Your team should consist of leaders in your organization plus any staff members that will be working directly with the consultant, like existing HR staff. If your consultant will be helping you build your organization’s first human resources department, a key staff member who’ll be leading HR tasks in the future should be included. 3. Conduct some preliminary research. Start searching online for top nonprofit consultants. There are plenty of useful resources out there that break out top consultants and their specialties (like our own guide to compensation consultants). Most human resources consultants don’t necessarily specialize in working with nonprofits, so determine in advance if you’d want a partner with experience primarily in the nonprofit sector. Don’t forget to reach out to your colleagues and contacts in other organizations, too. If you know another organization worked with a nonprofit human resources consultant, ask them about their experience. They’ll most likely have recommendations and insights to share. 4. Reach out to your top candidates. Once you and your team have narrowed down a shortlist of candidates, reach out to the top two or three. Start by introducing your organization, requesting more information on their services, and asking for references. Most consultants ask for full RFPs (or requests for proposals) from potential clients so that they can develop more comprehensive plans and strategies for helping their clients reach their goals. Once the consultants complete and present their proposals, you can begin narrowing down your choices even further. While not specifically about nonprofit human resources consultants, this guide to hiring a fundraising consultant includes useful explanations of what to look for in consultants’ proposals and how to rework them as needed. 5. Make your pick and get started! Once you’ve reviewed any proposals that your organization requested from candidates, it’s time to make your pick. Work with your team to settle on your favorite candidate, then notify them of your decision. You’ll most likely then need to finalize their proposed plan, agree on some logistics, and sign a contract. Remember, any consultant should serve as a partner for your organization, not simply an outside expert who’ll come in, fix your problems, and leave. In order to make the most of your engagement, your organization should be prepared to ask plenty of questions and learn from your consultant’s insights. If you’ve never worked with a consultant before or if you’re trying to build out your organization’s first HR policies, it can be tricky to know what to look for without understanding the field more generally. For some additional context, let’s cover the types of services that nonprofit human resources consultants typically provide. Your organization will likely have one or two specific goals in mind when searching for a human resources consultant. Candidates with general experience in HR consulting might do the trick for more general projects, but always make sure to ask about their experience as it relates to your particular needs, too. Remember, a human resources consultant is not an appropriate replacement or filler for a dedicated, in-house HR team. Many consultants don’t offer the types of services that these teams would perform, like payroll administration. However, consultants are strong partners for helping you to develop and train a well-equipped HR team. For smaller organizations that don’t currently have human resources departments or well-defined policies, it’s important to make sure you have a firm understanding of what strong nonprofit HR looks like. You’re most likely familiar with how human resources works in for-profit businesses and the sorts of roles it plays, but nonprofit HR requires a slightly different approach. Take a mission-driven, project-oriented approach. A nonprofit’s priorities are shaped by its overarching mission, but its strategies will vary greatly from one campaign to the next. Nonprofit HR should be guided by the core mission but able to adapt to changing projects. Make communication a top priority. Even more so than in a for-profit business, communication is key in a nonprofit. The unique pressures of the nonprofit sector and the campaign-by-campaign approach means everyone will perform better when they’re on the same page. Develop strategies for managing unpaid staff. Nonprofits rely on dedicated volunteers for all kinds of essential tasks, and they require clear management in order to effectively support your goals, just like paid staff members do. A well-organized volunteer program will include human resources elements. Take an assertive approach to recruitment. Recruiting top talent is hard work, especially for positions in nonprofit organizations. Don’t be afraid to take a strategic and assertive approach to recruit new staff members. Study up on the total rewards concept of nonprofit compensation to learn more. Try to anticipate changes and hardships. Tight budgets, leadership changes, and shifts in funding sources can all throw a wrench into your organization’s strategies. Human resources should plan ahead by developing executive succession plans, for instance. 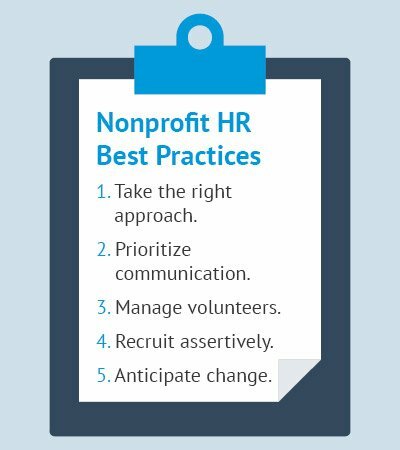 As you examine your own HR goals and needs and prepare to hire a nonprofit human resources consultant, keep these best practices in mind. You and your consultant should be on the same page about how to best prioritize and approach nonprofit human resources tasks and responsibilities. Finally, there are a few key characteristics that you should look for in any potential nonprofit human resources consultant for your organization. These might be fairly self-evident, but it’s still important that your team is aware of them. A strong proposal from a candidate is great, but unless you can see your team successfully working with them, that partnership might not be the best choice. A nonprofit HR consultant should have experience working on projects similar to your own, and with nonprofits similar to your own, ideally in terms of both mission and size. This will help to ensure that the consultant more fully understands your nonprofit’s particular circumstances and the unique pressures you feel in your space. When you reach out to candidates to discuss their services and your project, take note of how they describe their methods or general approach. As with practically any important project or initiative, a flexible and individualized approach is always more effective than a one-size-fits-all solution. Your nonprofit human resources consultant should be a great communicator, quick to respond to your questions, and good at explaining key concepts. Look for positive reviews online, or, better yet, reach out directly to their past clients for references. Make sure that the consultant’s work had a lasting impact on the performance of their previous clients’ human resources programs, not just a one-time fix that shortly wore off. Strong strategy and management of human resources underpin all successful organizations, both for-profit and nonprofit. With the unique pressures of the nonprofit sector, though, it’s crucially important that these organizations get it right. An expert guide is often the best bet for building out or correcting strong HR policies and structures that will support sustainable growth. Top 7 Compensation Consulting Firms for Any Sector. Strong compensation strategy should be a foundation for your larger recruitment and retention goals. Explore the different services offered by some top experts in the field. DNL OmniMedia’s Guide to Creating a Nonprofit Technology Plan. For more tech-heavy projects, like major CRM updates or overhauls, a new tech plan might be your best bet. Learn from these leading nonprofit tech consultants. HR Functions and Outsourcing. Human resources departments are increasingly outsourcing some of their more tedious tasks to third parties and tech solutions. There are a number of different ways nonprofits might do this, so explore your options if you think this might be a good move for you.